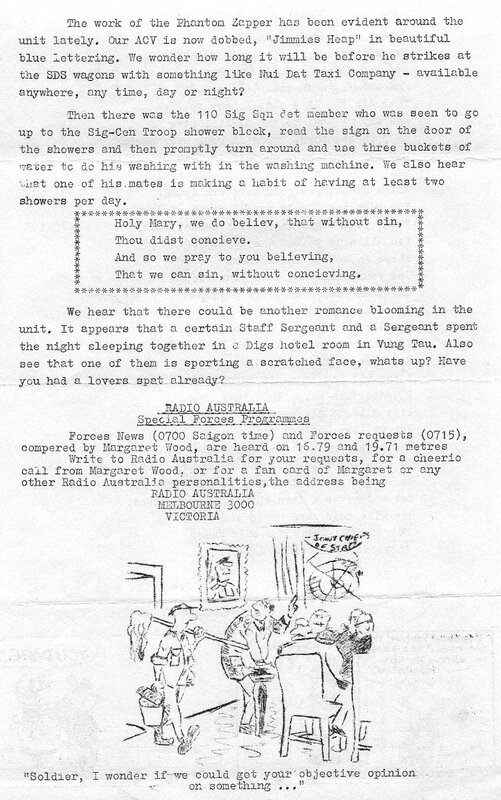 The first edition was delivered around the unit lines in the small hours of the morning, with copies 'mysteriously' appearing in tents and other suitable locations. 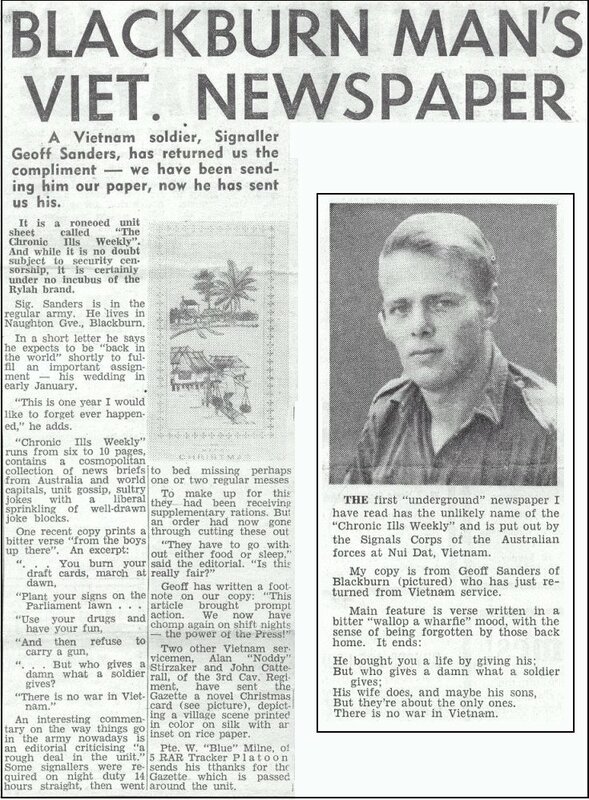 The response was absolutely outstanding, well received by the troops and issues raised were largely addressed fairly quickly by those who had previously tried to ignore them. 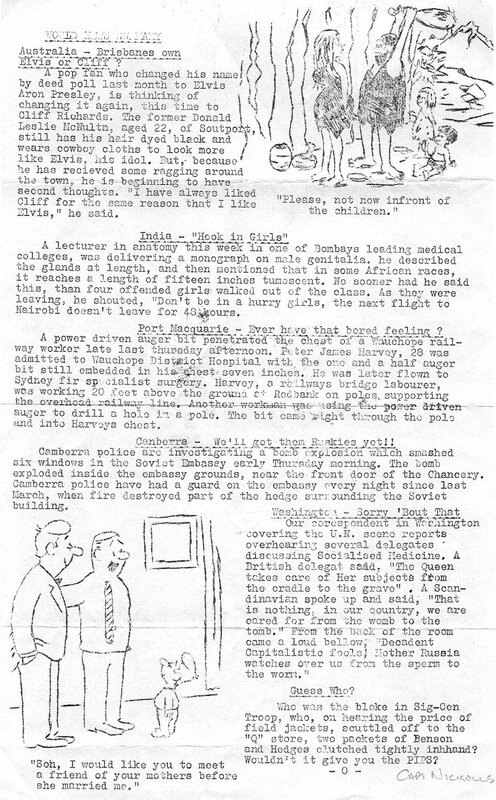 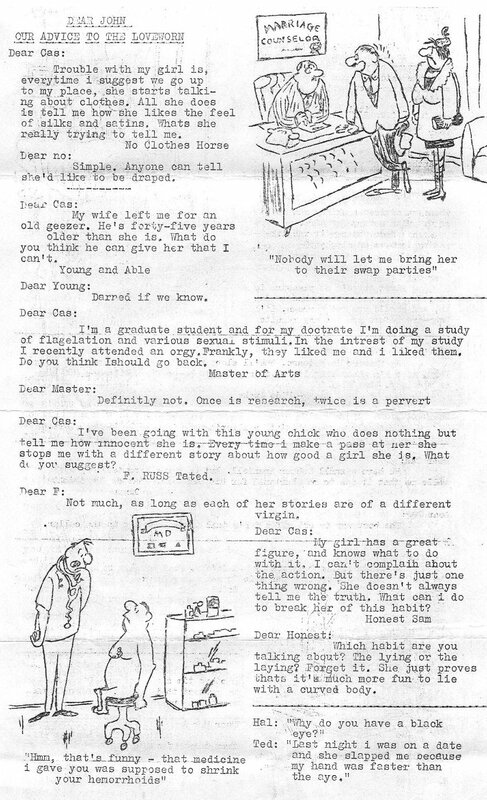 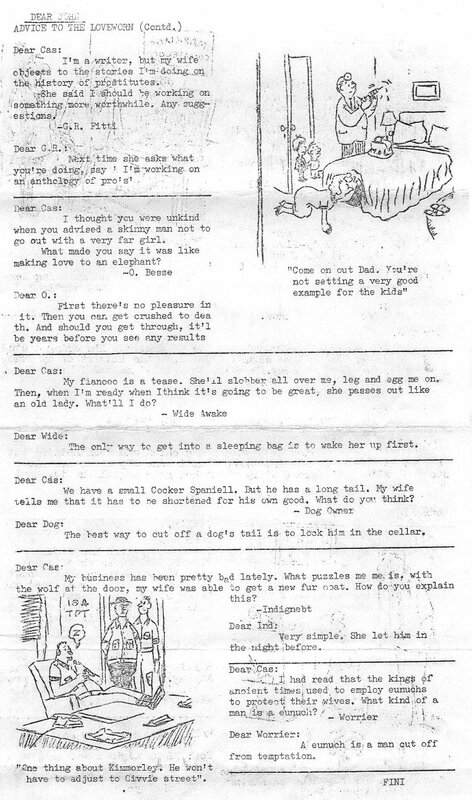 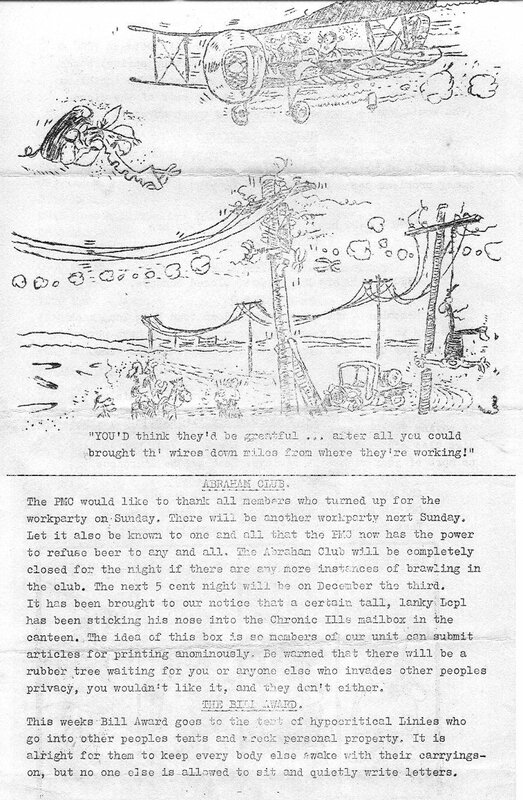 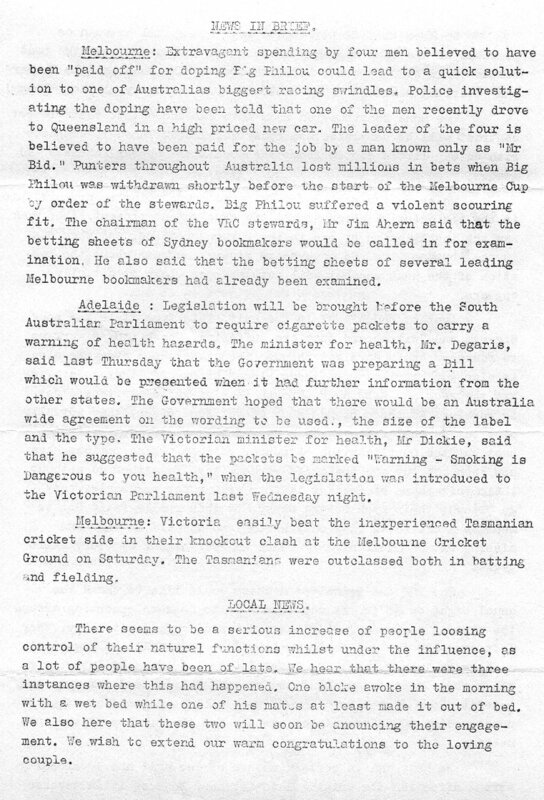 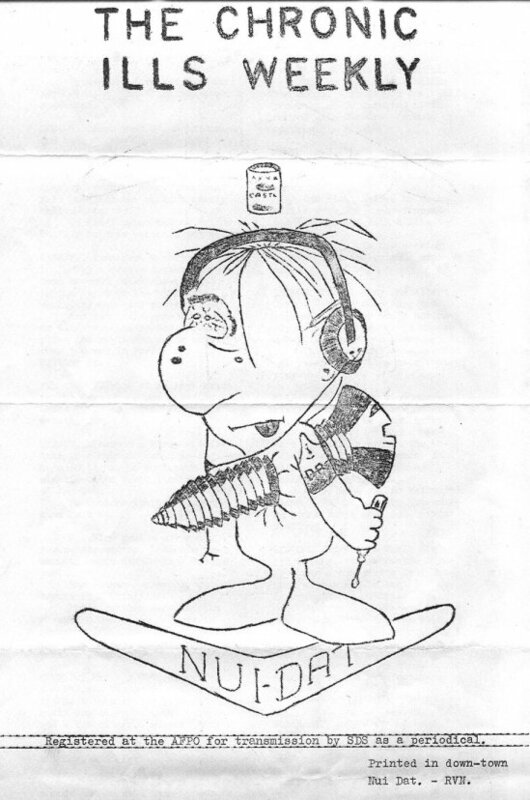 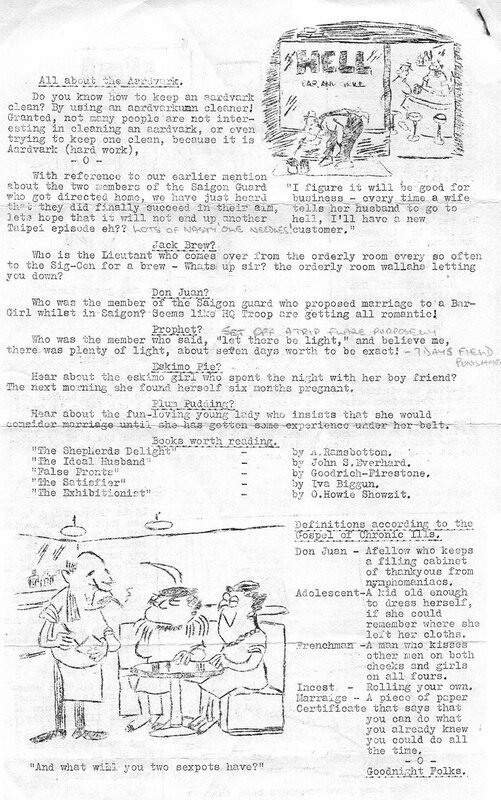 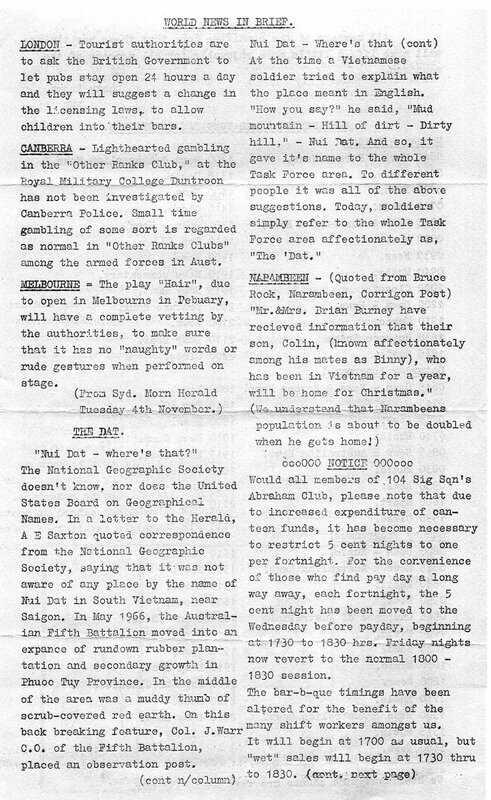 I would not like to claim sole editorship, as the production was a whole shift operation, although Col Elliot and myself would probably have to stand up and cop any flack from anyone whom we may offend today by the reproduction of these newsletters some thirty plus years later... anyone know where Col is these days? 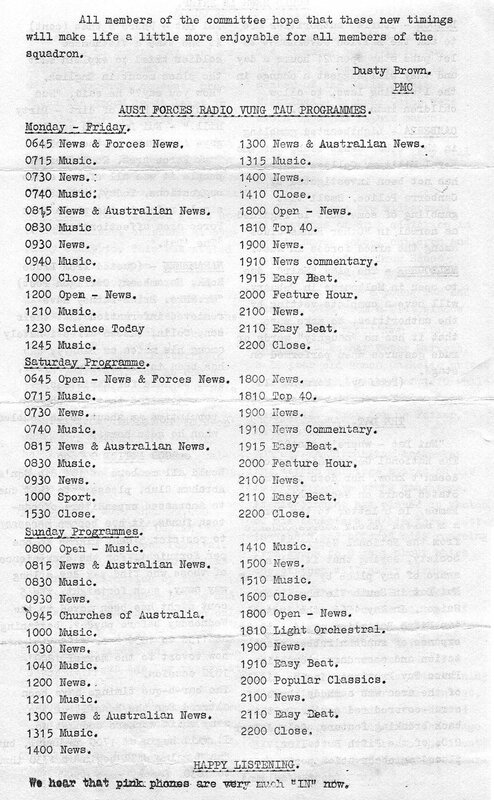 No issue or volume numbers appear on the covers. 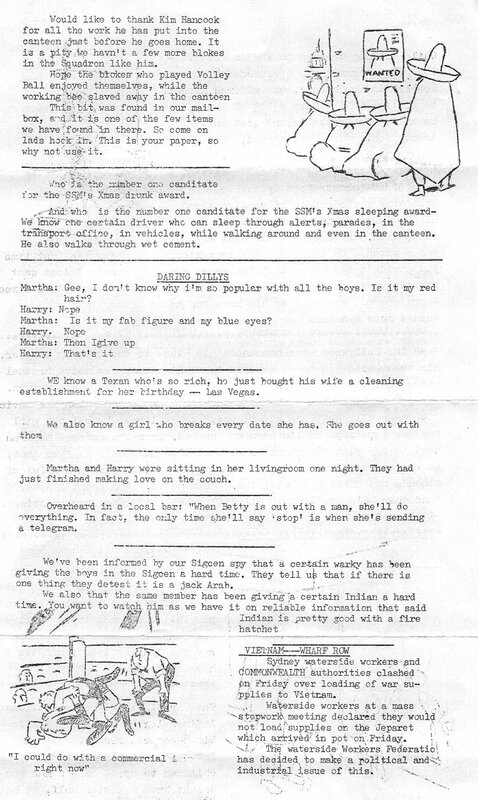 Due to the response, it was decided to continue production, as long as new material was supplied for publication. 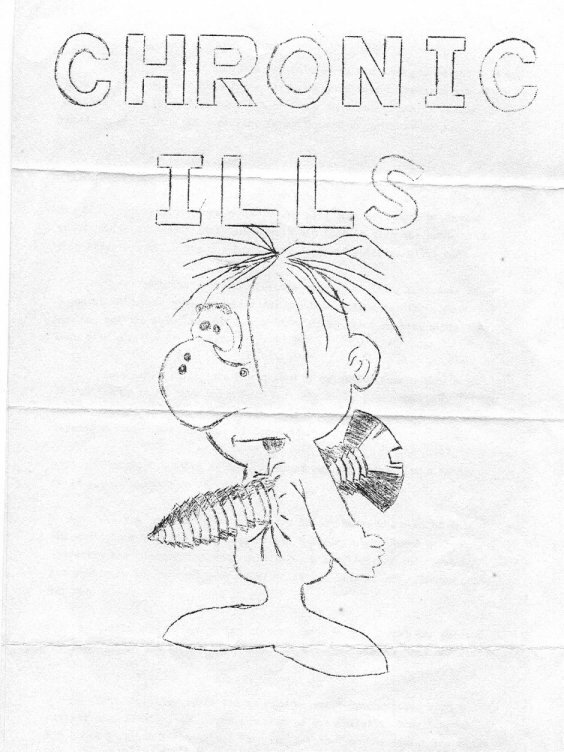 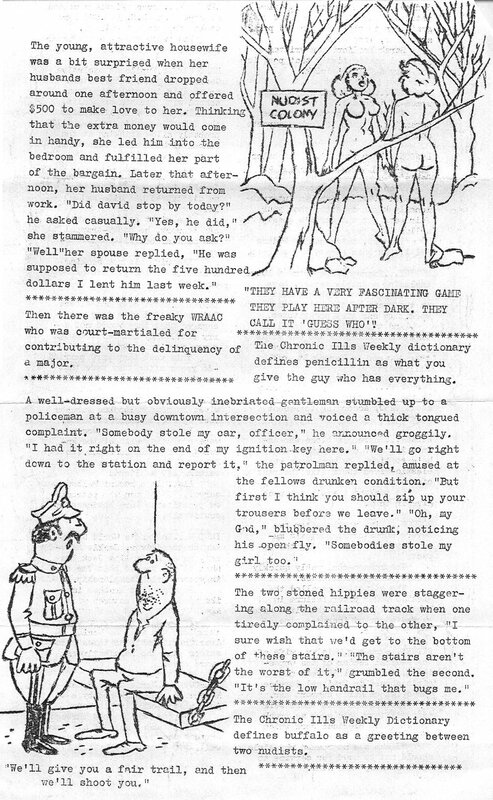 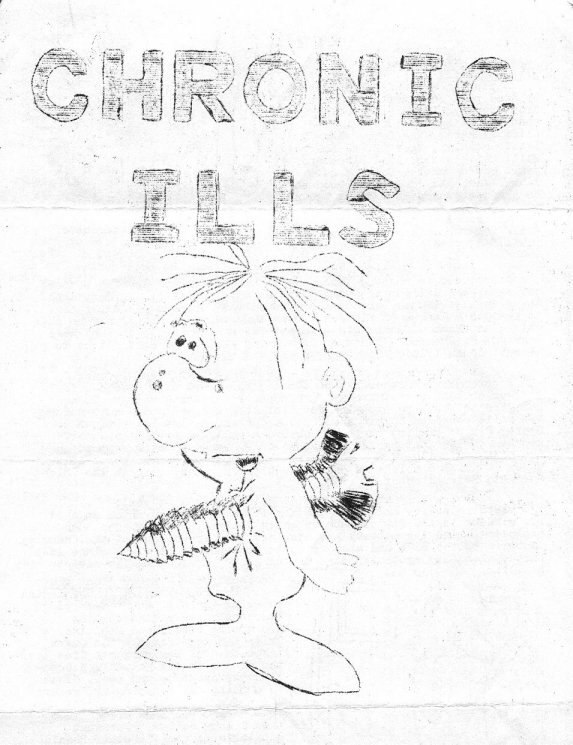 The clue to the sequence of the issues is to compare the various covers, with each successive cover having something new added - Chronic Ills graduated by the third edition to "The Chronic Ills Weekly" and as the cover stated, was distributed by SDS to other units around the task force, as our reputation had grown a bit by then! 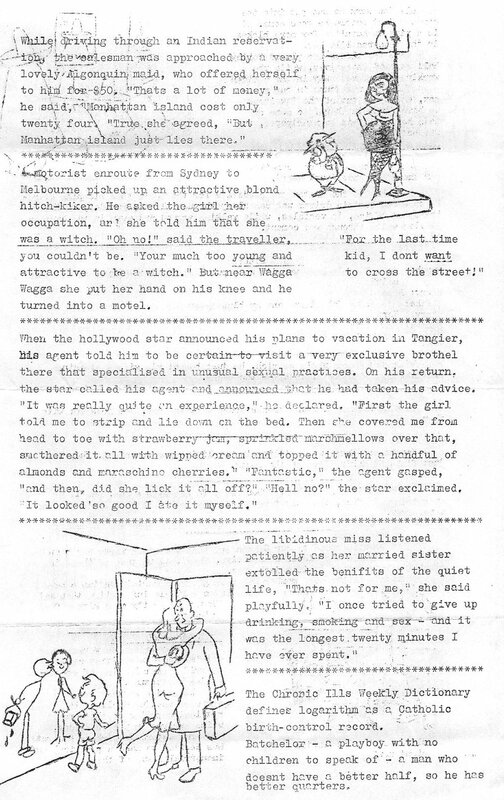 Six editions were published before I return to Australia - I am unsure if any subsequent issues were printed. 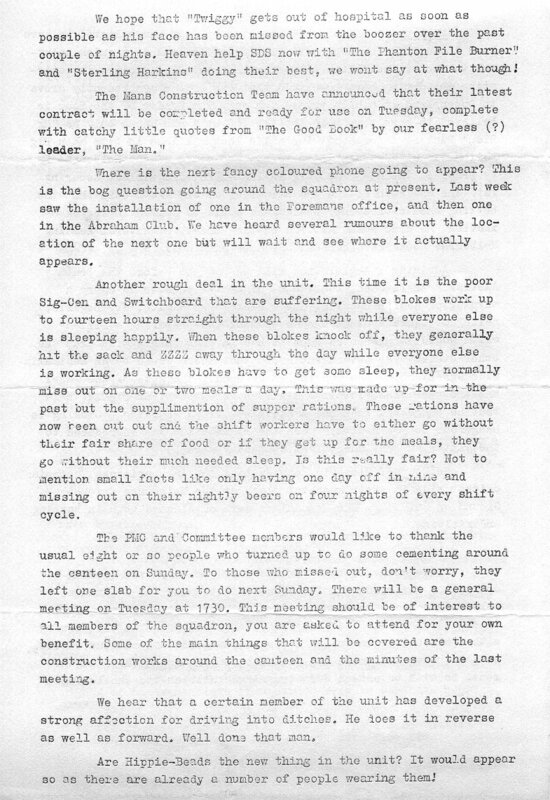 After we were denied access to the orderly room gestetner, a feeble attempt at trying to muzzle the power of the press... we simply accepted other invitations to print them elsewhere, including across the road in the HQ 1ATF orderly room, and from memory when that became off limits to us, we then migrated to the Intelligence Centre machine which I seem to recall was one of those new fangled electrically operated Gestetners, probably the only one in the whole of Nui Dat! 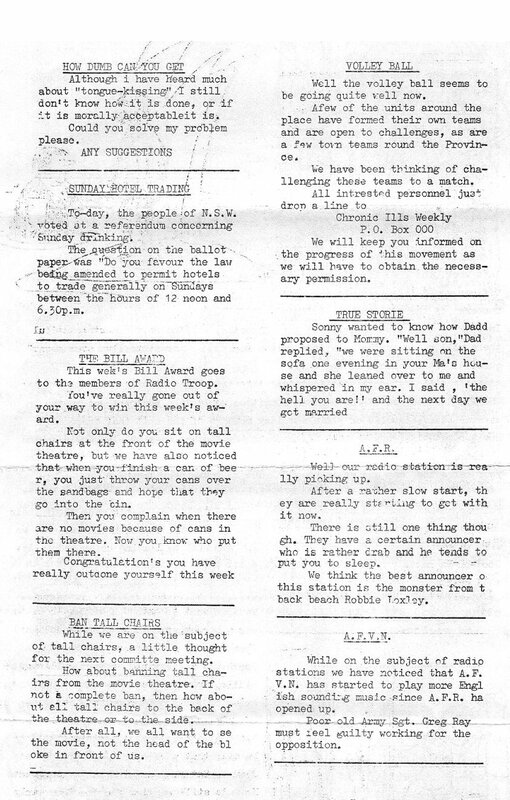 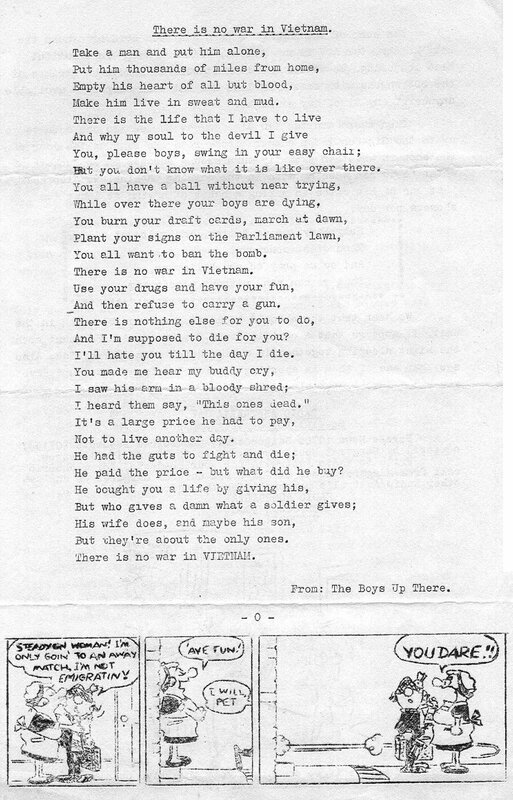 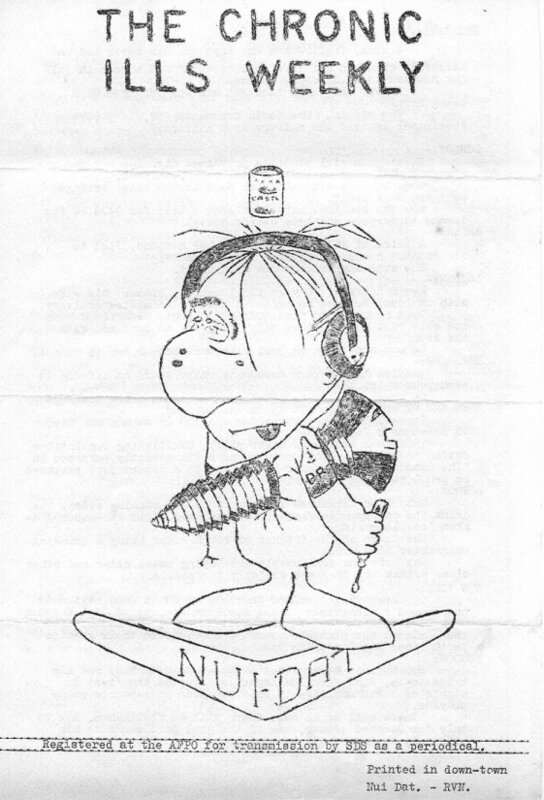 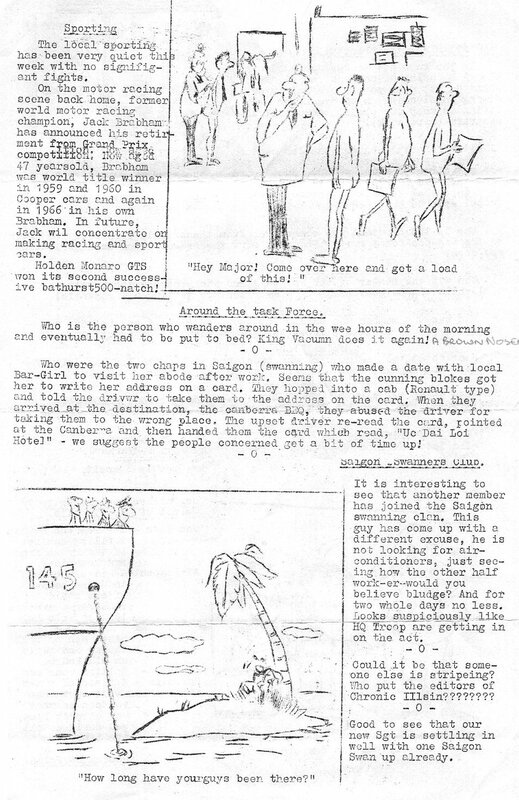 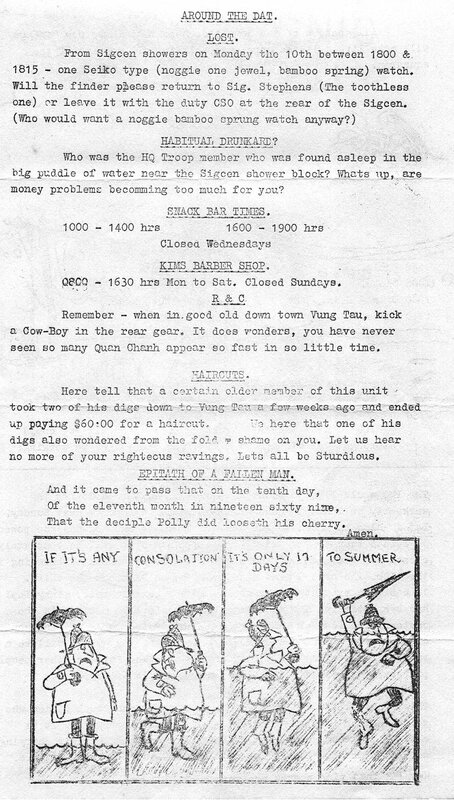 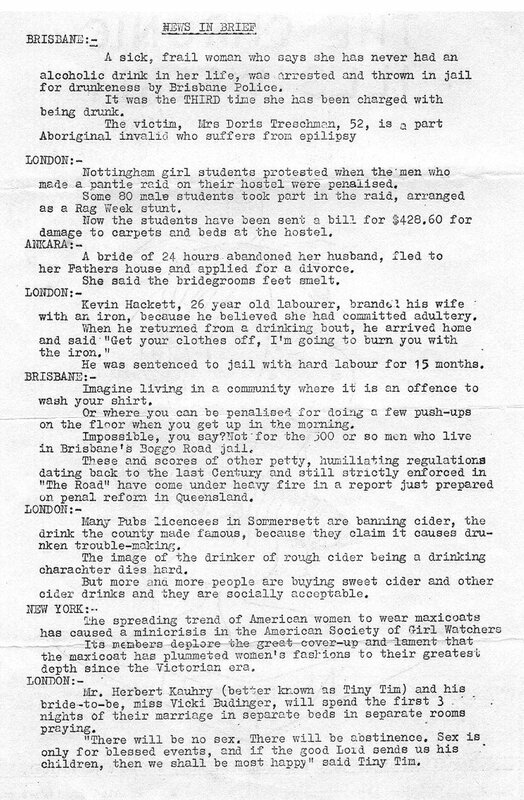 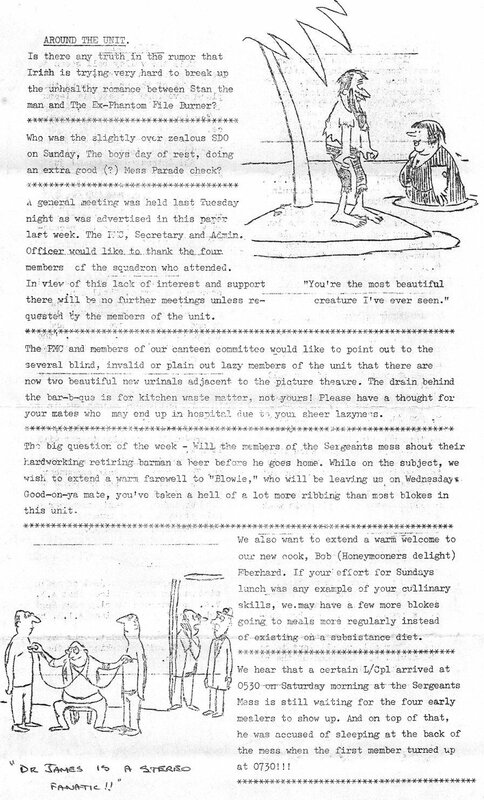 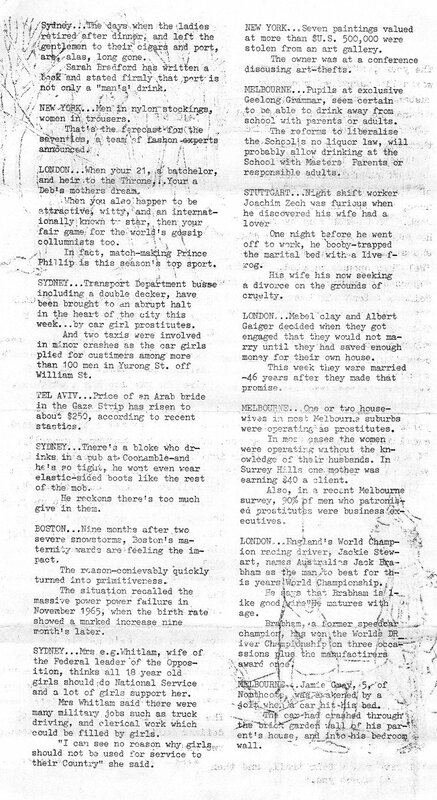 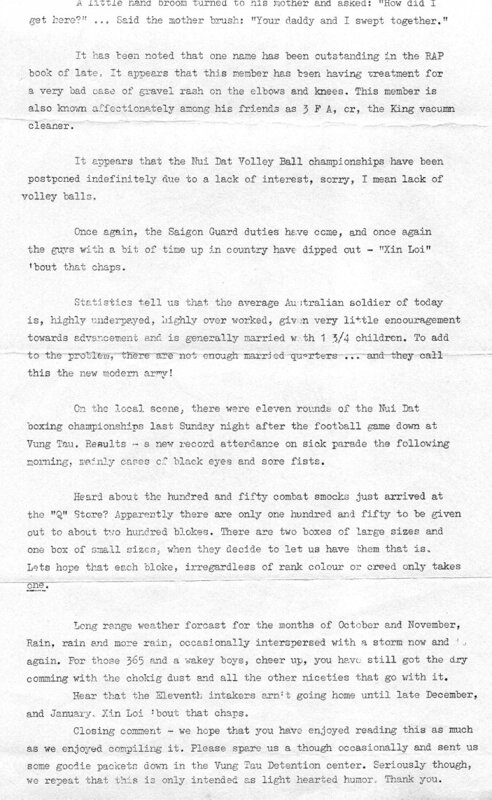 On arriving home the local Newspaper published two articles, on the underground newspapers from Nui Dat, to the delight of the 104 boys in Vietnam. 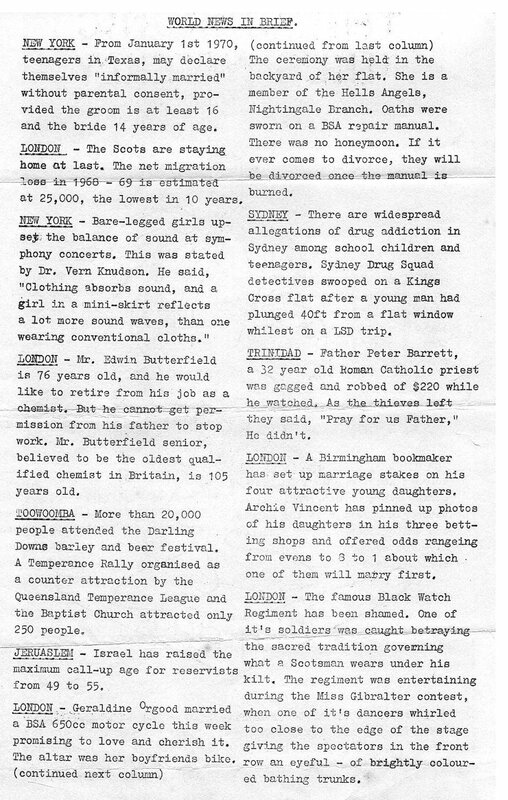 Note: Gestetner was a machine brand name for a Stencil Duplicator which was used to make copies of documents before today's Photo Copiers. 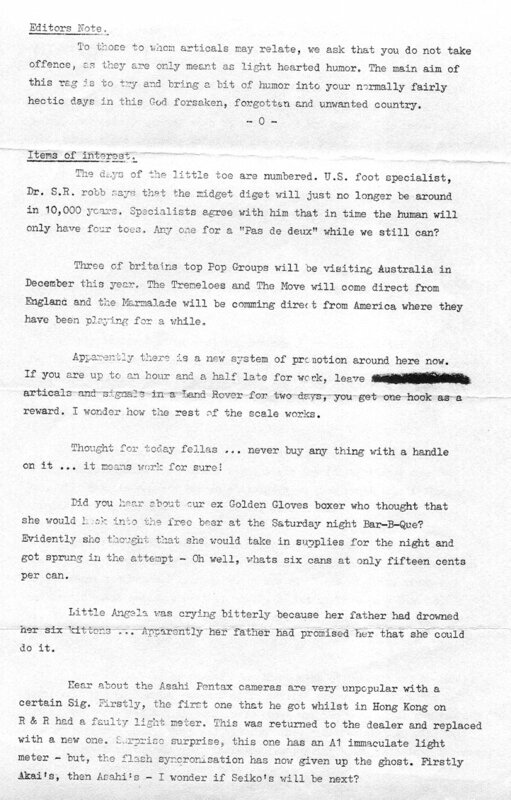 The stencils (skins) were prepared using a typewriter and much correction fluid. 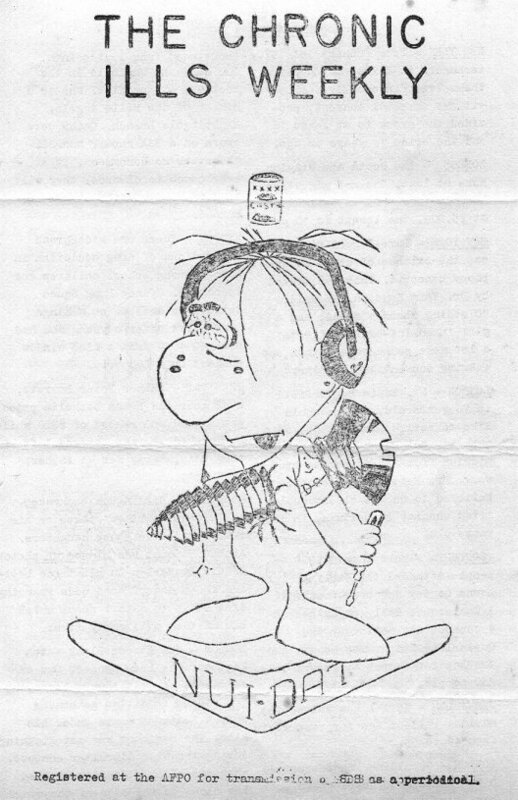 Drawings were produced using a steel tipped pen.